This tough, three day walk descends from Katoomba to the peaceful Megalong Valley. 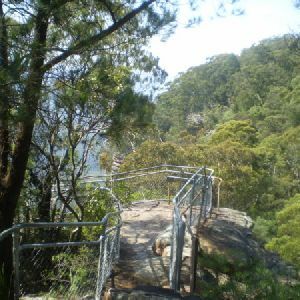 It uses the Six Foot Track to navigate its way down to the Cox’s River from where it returns to Katoomba via Dunphy’s campsite and Narrowneck. 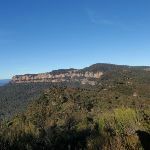 The walk has some stunning panoramas which are complemented by the close-up views over the Cox’s River and Katoomba cliffs. These notes are now several years old, and the environment will have changed, This walk is only for people comfortable walking off track, dealing with cliff passes and steep terrain in remote areas. * This walk passes through very remote areas and sections have no visible track. At least one person in your group should have training and experience in off track walking and navigation. Even with these notes and a GPS these extra skills and equipment are required. 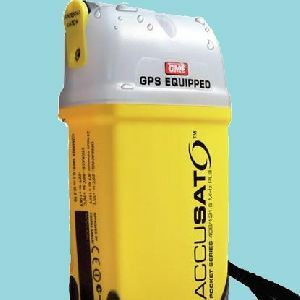 A Personal Locating Beacon (PLB) is a hand-held device that, when triggered, sends a message to the emergency services with your location. The emergency services staff can then look at your trip intention forms and decide how best to help you. 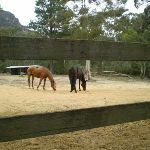 In the Blue Mountains, you can borrow these for no charge, just complete this Trip intention form, and a borrowing form. The device can be picked up from: NPWS Office – Govetts Leap Rd Blackheath – 9am to 4pm 7 days Ph: 02 4787 8877 Katoomba Police Station – 217 Katoomba St Katoomba – Anytime Ph: 02 4782 8199 Springwood Police Station – 4 Jerseywold Avenue Springwood – Anytime Ph: 02 4751 0299 More info. 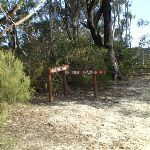 From the ‘Explorers Tree’ (at the intersection of Nellies Glen Rd and the Great Western Hwy), this walk follows the ‘Six Foot Track – 200m’ sign up along the sealed Nellies Glen Rd for just over 200m before turning left at another ‘Six Foot Track’ sign. Here the walk comes to a dirt car park and shelter with a large ‘Six Foot Track’ information sign. Continue straight: From the shelter and car park (on Nellies Glen Rd), this walk follows the ‘Six Foot Track’ sign around the lower locked metal gate to follow the management trail gently downhill. The walk continues down this trail, which becomes fairly steep in places, for about 500m. Here the trail flattens out and comes to an intersection marked with a couple of ‘Six Foot Track’ signs and a ‘Nellies Glen Bushland Restoration’ sign. 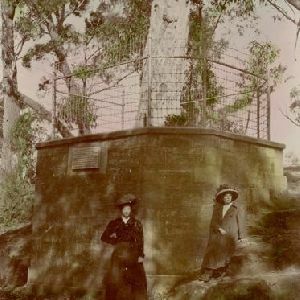 In 1813, the explorers Gregory Blaxland, William Wentworth and William Lawson, on their historic crossing of the Blue Mountains, engraved their names not only into the history books, but also reportedly into this tree on the side of Pulpit Hill. The tree now long dead was caged in 1884 in an attempt to preserve the engravings. The engravings are no longer visible and there is even debate over the last 100+ years as to the authenticity of the engravings. Turn right: From the intersection, this walk follows the ‘Six Foot Track’ sign, fairly steeply down the management trail past the ‘Nellies Glen’ metal plaque and, about 10m later, past the timber ‘Nellies Glen’ sign. After another 80m, the trail narrows and this walk turns left to head through the green timber chicane with the ‘Caution – Steep Decent’ and ‘Pedestrian Access only’ signs. As the sign suggests, this walk now leads steeply down the Nellies Glen canyon steps for about 300m, passing alongside the tall rock walls and crossing the usually small creek a few times before bending distinctly left to cross below a small set of falls (below the main Bonnie Doon Falls). Here the track mostly flattens out and leads along the side of the gully for another 400m to pass a ‘Blue Mountains National Park’ sign, then just over 100m later, passes another sign marking the lower end of ‘Nellies Glen’. About 600m after this sign, the track bends to cross a narrow gully then leads up to a small clearing at the northern end of the wide Nellies Glen trail. Veer left: From the clearing, this walk follows the wide trail gently downhill while keeping the valley to your right. 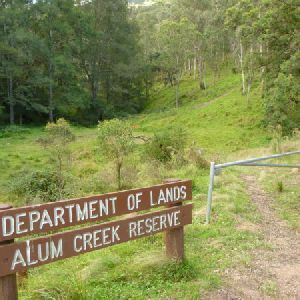 The trail leads generally downhill through the scribbly gum forest for about 1.4km to then cross the culverted Devils Hole Creek – just past the creek is an unused concrete pipe with wild bee hives inside. This walk continues along the trail for another 500m to an intersection with the Devils Hole Trail (on your left), marked a ‘Six Foot Track’ and a ‘Ladders have been removed’ sign. 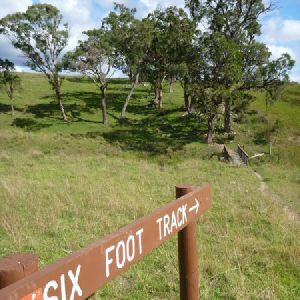 Continue straight: From the intersection, this walk walk follows the ‘Six Foot Track’ sign along the Nellies Glen trail, to cross the culverted Diamond Creek to then come pass alongside the old Megalong ‘Village site’ and horse paddock (which is on your left). In 1870, kerosene shale was discovered in the area surrounding the upper end of Megalong and Diamond Creeks so in 1885, Mr J. B. North started to mine the resource. The mine continued for nearly 10 years. During the life of the mine, the Megalong Village grew to to a small town with a hotel, butchery, bakery, public hall and around about 40 families. When the mines were closed in 1904, the best buildings were demolished and rebuilt in Katoomba. In the December of 1904, a huge bushfire ripped up through the valley destroying what buildings were left. 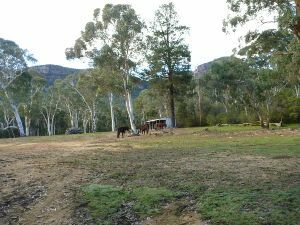 Now the area is private land with a horse paddock with a view of the escarpment behind. A small bronze sign marks the site . Continue straight: From the beside the historic Megalong ‘Village site’, this walk heads along the wide trail, initially keeping the horse paddock and view to the escaprment to your left after just shy of 250m this walk heads through a usually closed gate and continues gently undulating along the trail through the tall scribbly gum forest for 500m, crossing a usually small creek to then pass a 6FT ’40km’ arrow post. About 400m further along this trail, soon after crossing the usually small Corral Creek, this walk comes to a T-intersection, where a ‘Six Foot Track’, sign points back along the trail, and where there are some power lines to your right. Veer right: From the intersection, this walk heads west along the Nellies Glen Road trail, initially keeping the power lines to your right. After about 170m this walk veers right at the locked ‘Wari-Wari’ gate to climb the fence using a stile . The walk continue along the (now public) dirt Nellies Glen Road, for 900m passing a series of driveways, to rejoin then power lines for 120m passing just below a nearby house. Here the road leads downhill for 200m to pass a large ‘Road subject to flooding…’ sign then just 100m later this walk comes to an intersection with ‘Six Foot Track’ sign and stile (just before the road bends right to cross Megalong Creek). Continue straight: From the intersection, this walk follows the ‘Six Foot Track’ sign over the fence using the stile. A sign reminds walkers to stay on the track as this section is on private property. The walk leads through mostly open farmland for 130m passing a ‘Private Land No Camping’ sign to then cross Mitchells Creek, this creek may become impassable after heavy or prolonged rain. Over the next 300m the trail leads over a rise through the farmland to then cross a fence using a stile on the right. The track now leads through a denser forest for another 300m to cross ‘McLennan Bridge’, named after Mr Michael (Mick) McLellan who has been in charge of the maintenance of the 6FT for many years. Just shy of 150m after the bridge this walk continues straight at a four-way intersection for another 200m to cross a fence using a stile. Here the walk crosses the sealed Megalong Rd, to find a car park beside a clearing and several ‘Six Foot Track’ signposts (about 400m south of Megalong Creek). 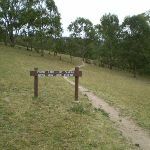 Continue straight: From the car park on Megalong Road (about 400m south of Megalong Creek), this walk follows the ‘Six Foot Track’ sign over the cattle grate or stile and goes beside the large sheltered ‘Six Foot Track’ information sign. Here the walk heads gently downhill along the dirt road for about 80m to come beside a stone memorial, marking ‘Megalong Cemetery’ (on your left). 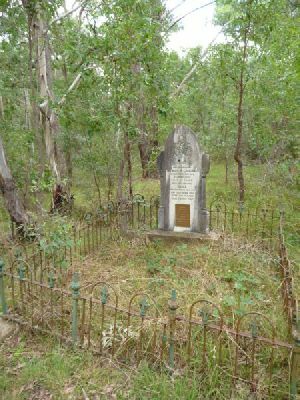 The Megalong Cemetery became the final resting place for at least 14 people who died between 1894 and 1931. Many of the grave sites are in poor repair or can no longer be easily found – please take care in the area to avoid any further damage. 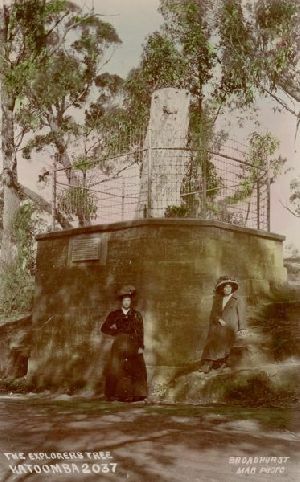 A tall stone monument marks the edge of the cemetery on the Six Foot Track, about 100m west of Megalong Road. This cemetery is currently under the management of the Blue Mountains City Council, and is recognised by the National Trust. Continue straight: From beside ‘Megalong Cemetery’, this walk heads gently downhill along the dirt road for about 80m to pass through gate with a ‘No Through Road’ sign. Just shy of 300m later, this walk passes a few driveways, beside the farmland to cross another cattle grate. Then about 150m later, the road leads close to Megalong Creek, where a sign reminds visitors this is private land. About 30m further on, the main dirt road veers right at a Y-intersection then crosses a cattle grate. Here the walk heads uphill along the dirt road for just over 200m (with views of the escarpment behind) to cross another grate and come to an intersection marked with a ‘Six Foot Track’ sign pointing right into the valley. Turn right: From the intersection, this walk follows the ‘Six Foot Track’ sign downhill along the narrow track into the valley. The walk now crosses a small creek on the timber ‘Guyver Bridge’, named in honour of Jon Guyver who worked hard to redevelop the 6FT as the track coordinator/administrator until 2010. Here the walk heads up the timber steps and over a rise. The track now follows a wire fence down through the farmland and across a valley (above a dam) for almost 100m to metal stile just before a dirt trail. Here the walk turns right and crosses the fence using the stile, then follows a ‘Six Foot Track’ sign along the track as it undulates over a series of hills for about 300m before crossing another fence using another metal stile beside a large tree. 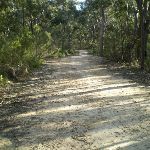 The track now leads uphill for 200m to pass a ‘Private Land – No Camping before Coxs River Reserve’ sign, then winds along the side of the hill for a further 150m before heading into a wooded forest and down some timber steps. The walk then crosses a steep gully and winds along the side of the hill for just over 100m to pass a ’35km’ 6FT arrow post, then 150m later, crosses another fence using a metal stile. Here the walk continues for another 600m through a mix of farmland and open forest, crossing a few more steep gullies with timber steps to head through a closed gate, marked with a few ‘Private Property’ signs. Continue straight: From the gate, this walk heads downhill along the narrowing track, keeping the valley to your right. After about 120m, this walk crosses a timber fence on a metal stile, then continues down the track over a few large rocks for just over 200m, to an intersection with a wide trail. Here the walk turns right then immediately left, to continue along the track as it narrows again. The track then leads down along the side of the valley for about 600m and passes through another usually closed gate, then about 250m later, the track passes a few granite boulders and heads down a few timber steps. 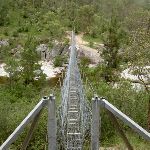 About 400m after this, this walk heads down a 100m-long series of timber steps to cross a gully and find a series of large granite boulders – one of the small overhangs is home to a wild bee hive. The track leads out of the valley and gently down along the side of the hill for about 1km, where the valley opens up with wider views down to the Coxs River, then heads down some more timber steps. About 250m later, the track leads down another set of timber steps to then head through a pleasant lush gully with views close to the river. The track then heads along the hillside for another 150m to an intersection (just above the swing bridge, to your right), marked with a ‘Six Foot Track’ and ‘Alternative Bridge’ signs. Turn right: From the intersection, this walk follows the ‘Alternative Bridge When River High’ sign down the timber steps to the southern end of the ‘Bowtells Bridge’. 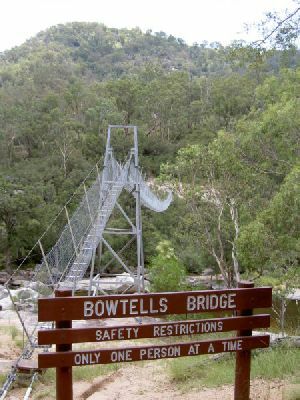 Here the walk climbs the ramp and crosses the Cox’s River on the suspension bridge, observing the ‘Only one Person at a time’ safety sign. This crossing can take some time with a large group – the bridge does swing a fair bit and people concerned by heights may find this challenging. The bridge spans 100m, giving great views of the river below. 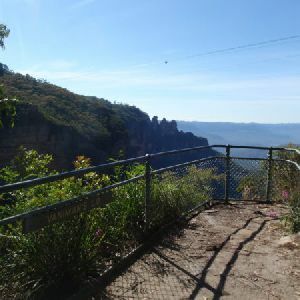 On the far side, this walk steps off the bridge onto the large rock platform.
. Bowtell grew up in Katoomba and is now buried in West Malaysia. Continue straight: From the north side of the bridge, this walk heads up the timber steps through the dense forest to soon pass the ‘Bowtells Bridge’ sign. At the top of these steps, the track bends left then leads along the side of the hill for 500m, crossing a few gullies and undulating up and down a series of timber steps to then pass between a couple of fences posts. Here the walk continues down a series of timber steps to a clearing and intersection marked with a ‘Private Land – No Camping’ sign. Turn sharp right: From the intersection and clearing, this walk follows the ‘Camping Ground-500mtrs’ sign north up the timber steps. The track soon bends left and follows the side of the hill for about 130m to then head through a gate with a ‘Welcome’ sign. The walk continues along the clear track for another 70m to the intersection with the timber path just below the ‘Six Foot Track Lodge’. Continue straight: From the intersection below the ‘Six Foot Track Lodge’, this walk follows the clear track west initially keeping the lodge up to your right. After about 30m this walk crosses a gully then climbs over a fence using stile. Here the walk turns right and follows the track for almost 50m to a T-intersection with a wide trail, beside a private property gate and marked with several ‘Six Foot Track’ signs. Veer left: From the intersection, this walk follows the ‘Camping Ground-200m’ sign gently down along wide trail. 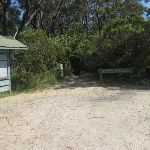 After about 230m the trail flattens out and passes below the main camping area marked with a ‘Coxs River Reserve’ sign. About 30m past here, this walk comes to a clear intersection with a dirt road marked with a ‘Six Foot Track’ sign. 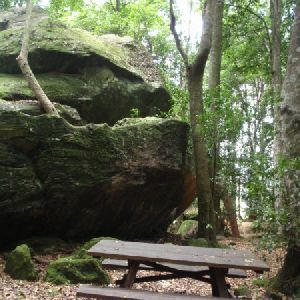 Cox’s River Campsite, on the Six Foot Track, is situated on the western bank of the Cox’s River. 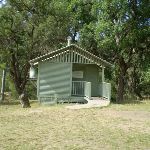 It provides a shelter, water (rain tank or creek – treat before drinking either), picnic tables, toilet and a flat grassed camping area with excellent access to the river. 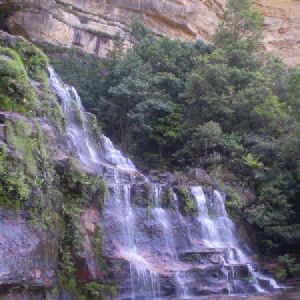 The Coxs River starts west of Katoomba, running south-east as the main tributary for the Warragamba Dam. The Six Foot Track crosses the river using on the slippery rounded stones or, when in flood, the large metal Bowtells Bridge. The campsite is located a short distance up the west bank from where the 6FT crosses. The water must be treated before drinking. 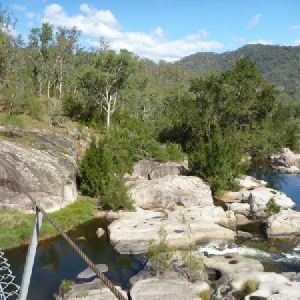 The river provides some potentially nice swimming spots, with pools and interesting granite rock formations, be very careful if deciding to swim as it can also be a very dangerous. This is the planned overnight stay for the end of day 1, happy camping. Turn sharp left: From the the intersection south of the Coxs River Campsite, this walk follows the ‘Six Foot Track’ sign downhill for 40m to the sandy beach on the bank of the river. Please heed the ‘Do Not Cross River When In Flood Use Alternative Bridge’ warning sign, this river is normally about shin deep, if deeper consider using the swing bridge upstream. From the beach, this walk crosses the river that may flow in two or three sections across smooth and slippery rocks. On the far side this walk comes to a clearing on the floodplain. Turn right: From the east side of the Cox’s River Campsite, this walk heads south-east alongside the river, through the pastures where cows often graze. At this point, the track is not defined. As such, the best navigational tool is the river. After leaving the paddocks, the walk continues between the fence on the hill, and the river. 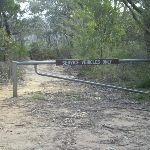 There are numerous ‘No Entry’ signposts, indicating private property – in order to walk through this section of land, you will need to obtain permission from the owners or walk right next to the creek, which is public land. 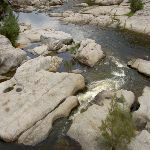 This walk continues around the river, turning to the east, taking the easiest routes around the numerous boulders and rocks strewn around. The walk continues in this manner, as the river turns back around to the south. Power lines can be seen in the distance. After crossing underneath these, the walk continues for approximately 100m before coming to an intersection with a management trail, marked by a bridge going across the Cox’s River. Continue straight: From the intersection, this walk heads south, keeping the Cox’s River on the right. 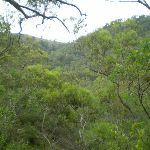 The walk follows a reasonably well-defined bush track, however at times this becomes slightly less well-defined, particularly in the areas of high grass and boulders. There are occasional ventures through stinging nettles. 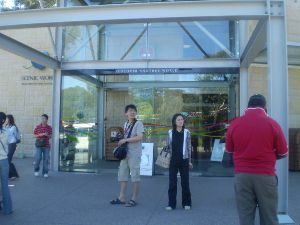 The walk passes numerous signposts saying ‘Blue Mountains National Park’ and pointing south along the river, as well as signs prohibiting camping. After a while, the trail comes to a small gate and a ‘Blue Mountains National Park’ sign. Continue straight: From the gate, this walk heads south, keeping the Cox’s River to the right. The track is quite well-defined around here but tends to fade when going through areas of boulders and grasslands. There are steep hills on both sides of the creek, and some great views to the south. About 1.3 km past the gate, the trail crosses the river – At the time of writing, this was marked by a large stick stuck into the ground, ahead of which the dense bushland comes down to the river bank. After crossing the river, the track continues along the western bank, keeping the river to the left. This continues for approximately 1.6 km until crossing back to the eastern bank of the river. Note: This crossing is not as noticeable as the first one and therefore it is necessary to watch for the track on the opposite side of the creek. The track continues south along the river, though staying about 30m back from the banks. The walk passes several small campsites and soon comes to the junction of Breakfast Creek (which goes to the left). 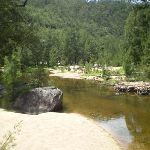 This campsite is located at the junction of the Cox’s River and Breakfast Creek. 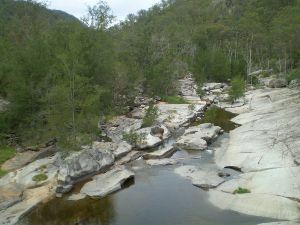 Fresh water is available from the Cox’s River but should be treated before drinking. There are no facilities at this campground. Turn left: From the junction, this walk heads east along Breakfast Creek, keeping the creek to the right. Very soon, the track crosses to the southern bank, but its easier just to walk along the creekbed for the first little section. After joining up with the track on the western bank, the walk continues east. This continues for several kilometres until the trail stays on the northern bank for quite a large section before climbing up and over a small steep knoll and then joining back up with the river on the eastern side. After crossing the knoll, the track continues east in the same manner as before, with the track frequently crossing the creek. The track comes to a distinct turn in the creek, where it heads north, and an intersection with a rough bush track coming down through Bad Dog Gully from the Blackhorse Ridge Track. Continue straight: From the intersection, this walk heads north-east on the track running next to Breakfast Creek. The track crosses the creek at numerous points, while steadily and gradually climbing. 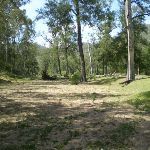 Approximately 1km after the intersection and on the east side of the creek, the track passes a reasonably large clearing which has clearly been used as a campsite. From here, the walk continues north-east along the bush track until gradually turning more to the east and the creek becomes largely dried up. Near the top of the creek, the track turns right and sharply heads uphill through the cleared grasslands to the east. The walk follows a faint outline of a management trail. 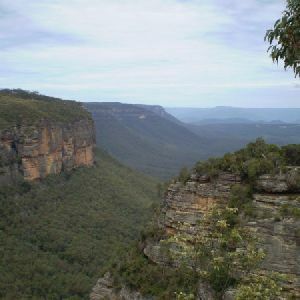 This continues until the track bends to the north (left) and heads along the management trail, passing by a sign saying ‘Blue Mountains National Park – Please Take All Rubbish With You’. Approximately 50m up the hill from here, the walk crosses over a fence at a National Parks stile, then comes to an intersection with a more distinct management trail. Veer right: From the stile, this walk turns to the right, initially heads east on the management trail. This heads up the hill for approximately 250m until coming to a campsite marked with a signpost saying ‘Dunphy’s Camping Area’. 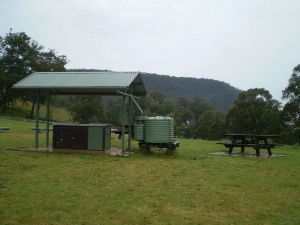 Dunphy’s camping area is at a large clearing next to the very southern end of Megalong Valley Rd. There is a large, well-built toilet, barbeques with shelter and a rainwater tank. There are also information signs on the walks and tracks in the area. The campsite is next to private property so be prepared to wake up in the morning to cows and horses wandering around the campground. This is the planned overnight stay for the end of day 2, happy camping. 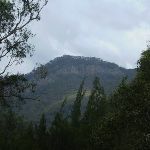 Veer left: From Dunphy’s camping area, this walk heads south-east, steeply up the management trail following the signs to the ‘Bellbird Ridge Lookout Track’. Once reaching the first rise, the track turns slightly north and continues to climb more gradually. 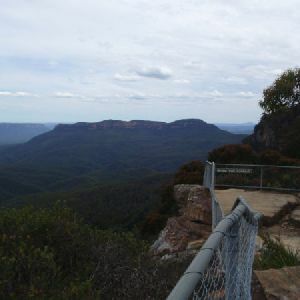 Once reaching the ridge, the track continues along the flat management trail, gradually turning back to the east until coming to a large gate signposted ‘Blue Mountains National Park’. About 150m later, the walk comes to an intersection marked by a green signpost saying ‘Bellbird Point 1.5km’. Continue straight: From the intersection, this walk heads east along the wide management trail for approximately 550m. The walk then comes to an intersection with a more distinct management trail, signposted ‘Medlow Gap Management Trail’, directly under the high-tension power lines. Continue straight: From the intersection (at the ‘Medlow Gap Management Trail’ sign), this walk takes the overgrown management trail north-east under the power lines. Near the tower, the walk turns to the east (right), following the rough bush track directly up the hill. This section of the track is very steep and often slippery. The track continues to be very steep until reaching the first set of cliffs. The track heads around to the north slightly (left) around the knoll for approximately 50m until coming to a chimney and set of chains on the rock, this is the bottom of Carlon Head Pass. Carlon Head Pass has a chain and metal spikes to assist with three consecutive drops of about five metres each. This is a vertical climb/descent and the chain is secured to the rock. Great care is required to scale Carlon Head pass safely as it is very exposed. Continue straight: From the top of Carlon Head Pass, this walk heads east away from the view, through thick forest and scrub. The track is unclear much of the way, but it follows the ridge line till coming to the public toilets at the fire tower on Bushwalkers Hill. 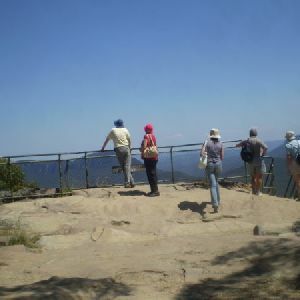 Turn left: From the fire tower at the top of Bushwalkers Hill, this walk heads north, following the dirt road through the thick gum tree forest and through the scrub. The trail undulates along Narrow Neck ridge, until it comes to the intersection of the southern Castle Head track. Continue straight: From the intersection, this walk follows the dirt road up to the top of the steep hill. The track then flattens out and continues along until it reaches the intersection of the northern Castle Head track. Continue straight: From the National Park gate, this walk follows Glenraphael Drive north through the parking area. 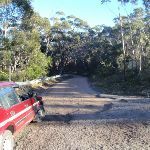 The dirt road continues through the bush, undulating along the ridge for about 1km before coming to the signposted intersection at the top of the Golden Stairs, with some more car parking either side of the road. 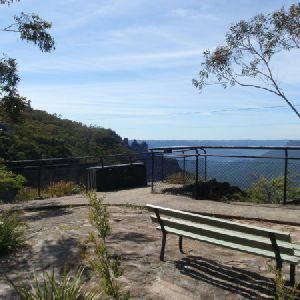 Continue straight: From the Golden Stairs car park, this walk follows the dirt road north, down the gentle hill and along the ridge as it undulates up and down for about 1km, before reaching the Sydney Water management trail – this is closed to the public at all times. Veer right: From the intersection, this walk follows the dirt road heading up the hill and undulating along the ridge for about 1km, before it climbs up to the intersection with Cliff Drive. Turn sharp left: From the intersection, this walk heads up Cliff Drive briefly, then follows the management trail on the right, just past the house. 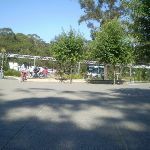 At the end of the trail, this walk turns right onto Violet Street, following this to the front entrance of Scenic World. 28km of this walk has short steep hills, 9km has gentle hills with occasional steps and another 8km is very steep. Whilst another 1.5km section of this walk is flat with no steps and a 550m is very steep with difficult rock scrambles. The remaining 95m is very steep with exposed rock scrambles and climbing. 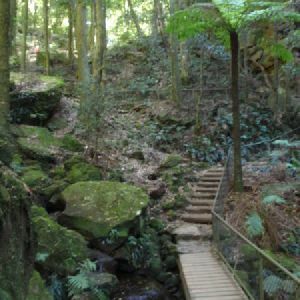 21km of this walk follows a formed track, with some branches and other obstacles and another 20km follows a clear and well formed track or trail. Whilst another 5km follows a rough track, where fallen trees and other obstacles are likely and a 1.3km section follows a rough unclear track. The remaining 95m follows a known route where there is no visible track. 27km of this walk has directional signs at most intersection and another 13km is clearly signposted. Whilst another 7km has minimal directional signs and the remaining 1.4km Has no directional signs. 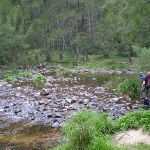 20km of this walk requires no previous bushwalking experience and another 15km requires a leader a with moderate level of bushwalking experience. Whilst another 13km requires some bushwalking experience and the remaining 95m requires a leader with a high level of bushwalking experience. 29km of this walk is not usually affected by severe weather events (that would unexpectedly impact safety and navigation) and another 18km is affected by storms that may impact your navigation and safety. Whilst another 720m is affected by forecast, unforecast storms and severe weather events that may impact on navigation and safety and the remaining 95m forecast, unforecast storms and severe weather likely to have an impact on your navigation and safety. 21km of this walk is close to useful facilities (such as fenced cliffs and seats) and another 14km has limited facilities (such as not all cliffs fenced). The remaining (12km) has limited facilities (such as cliffs not fenced, significant creeks not bridged). 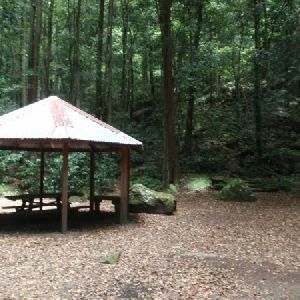 A list of walks that share part of the track with the Cox’s River return via Dunphy’s campsite walk. 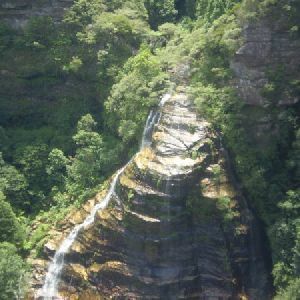 This walk has heritage interest and views, starting at the famous Explorers Tree and finishing with views of the cliffs from Nellie’s Glen lookout. The briefness of this walk makes it a great way to finish your 6 Foot Track walk if you have come from Jenolan. It’s also a great way to start the 6 Foot Track by seeing the terrain. 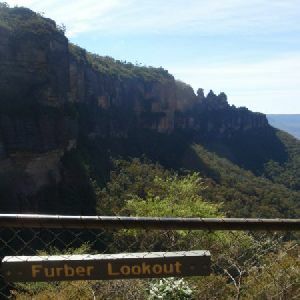 This short walk takes you from the western end of Katoomba, initially following the cliff line, then following Pulpit Hill Road to the Explorers Tree. 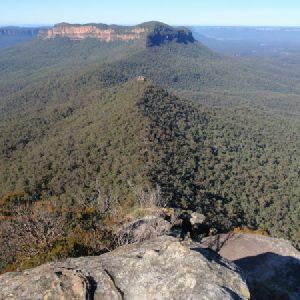 There are optional side trips to lookouts, providing great views across the Megalong Valley. In addition to the great views, the walk provides the opportunity to see a piece of Australian heritage. From the locked gate on Glenraphael Dr, on Narrow Neck, this walk heads out to Castle Head lookout. 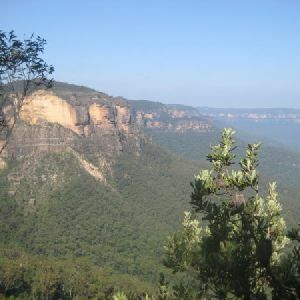 From the Lookout, there are fantastic views over the Jamison Valley back to Katoomba and over to Mount Solitary. You get a birds eye view of Ruined Castle, and distant views of the Three Sisters. 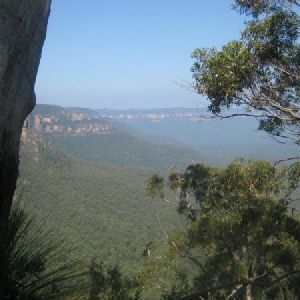 Much of the walk follows the western escarpment, giving views most of the way. The road out to the gate is dirt, and is generally well maintained. Enjoying a variety of different environments, Devil’s Hole trail descends into the valley below Katoomba via the Six Foot Track, before rising up through the difficult, and often slippery, Devil’s Hole. This is definitely one of the more difficult trails in the area. 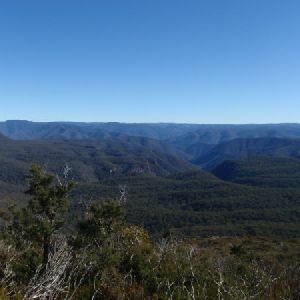 Walkers can enjoy great views from the top of the valley at both ends of the walk, as well as an extremely pretty creek environment as the track passes through Nellie’s Glen. 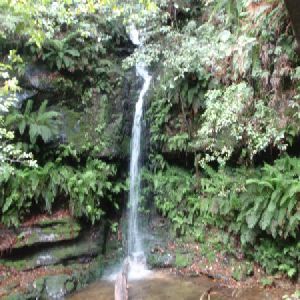 A list of walks that start near the Cox’s River return via Dunphy’s campsite walk. 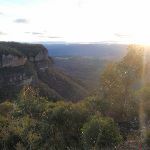 This short walk explores the Blue Mountains National Park just west of Katoomba, winding around the cliff tops to the Nellies Glen lookout, and offering a side trip to the Therabulat Lookout, both of which provide great views across the Megalong Valley. This walk can be enjoyed by the whole family and offers a great introduction to what the National Park has to offer. http://new.wildwalks.com/wildwalks_custom/includes/walk_fire_danger.php?walkid=nsw-sfthr-nwn Each park may have its own fire ban, this rating is only valid for today and is based on information from the RFS Please check the RFS Website for more information.